Dubai: The tension is palpable as a SWAT (Special Weapons and Tactics) team prepares to storm a building where a group of terrorists has taken people hostage.The team breaks into the building and engages the terrorists in close combat before emerging with a victim on their shoulders. Shots are fired and commands are shouted out as another team works its way into the building. Loud cheers erupt as the SWAT team emerges out of the building. This was as close as it got to a real life situation at Dubai Police’s Al Ruwaiyah Training Centre located off Emirates Road as SWAT commandos from 29 countries demonstrated their tactical skills, mental focus and physical endurance as they went about their tasks in various emergency scenarios. The five-day event that began on Sunday and ends on Thursday features 48 teams participating across five categories. Dubai Police teams won the top two positions on day one while a Serbian team finished third. Dubai Police SWAT teams A and B won Dh5,000 and Dh3,000 respectively, while the Serbian team won Dh2,000. 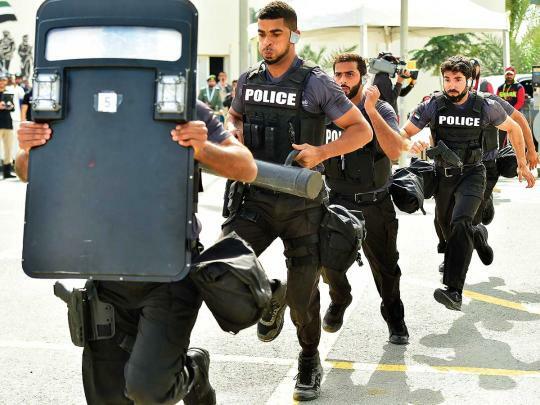 Finishing the mission in 41.46 seconds, Dubai SWAT Team A trumped their colleagues in Team B by a difference of just one second. The Serbian team finished their task 44 seconds. “All praise to Allah, this is a great achievement to top the first round and every team member deserves full credit for all the hard work. We are looking forward to repeating our performance over the next four rounds,” said Sultan Al Muslihi, member of the winning team. “The idea is to bring some of the leading international SWAT teams together to compete as well as to interact with each other and learn new tactics and methods from each other. The job of the police and law enforcement agencies is the same everywhere, it is to have safe communities and getting together police officers from different parts of the world helps in learning from each other,” said Major-General Abdullah Khalifa Al Merri, chief of Dubai Police. Over the next four days, the SWAT teams will face challenges across various scenarios including tower challenge, sniper attack as well as obstacle course. The idea is to bring some of the leading international SWAT teams together to compete as well as to interact with each other and learn new tactics and methods from each other. “This is the first time we are participating in such an event and we prepared for more than a month for this. We got the first round under our belt and we feel pretty good about it. Training and participating in a real emergency situation is quite different than taking part in an event like this. A challenge like this helps bring out the teamwork and that’s quite valuable,” said detective John Nodalny, team leader of New York Police Department’s emergency services unit. A total of $170,000 (Dh620,000) in cash prizes are at stake, including a daily challenge prize of $10,000 (Dh36,500) for the top three teams. The UAE SWAT Challenge is being held under the patronage of Lt Gen Shaikh Saif Bin Zayed Al Nahyan, Deputy Prime Minister and Minister of Interior.